My mom was not always the most amazing cook or baker, but somehow I have childhood nostalgia for a few recipes we made as kids. My mom’s recipes had a bit of an early burial. After college my sister purchased a used laptop. This was back in the day when a laptop was as thick as a brick, and cell phones were used in cars for emergencies and also looked like bricks. Not long after she purchased the laptop she decided to transfer all of my mom’s recipes over to the laptop and get rid of the paper versions. Made sense at the time right? Not until the laptop died and she lost everything on the hard drive. This was before we had a zillion ways to back up a computer. It was a sad day. Over the years I have thought about that laptop and all the recipes we lost. I still have some of my mom’s cookbooks, but the recipes on index cards, worn and used are long gone. A few of the recipes I remember and have not tried to recreate, but there was one particular recipe that I have tried countless times to recreate with no success. I have tried to remember the ingredients and put together what I think were the amounts, and I have tried to find a recipe on the Internet with similar ingredients, with no luck. I have had runny finished products, nasty tasting ones, and ones that were just boring. Chris has given up on me finding it. I am relentless. I will try until I find it. Recently I found this version on Design Sponge. Still not my absolute favorite but it gets closer to the real deal. We were lazy and purchased a pie crust rather than making it from scratch. For the full recipe click the link below (pie crust included). We also just used ice cream rather than their whip cream. 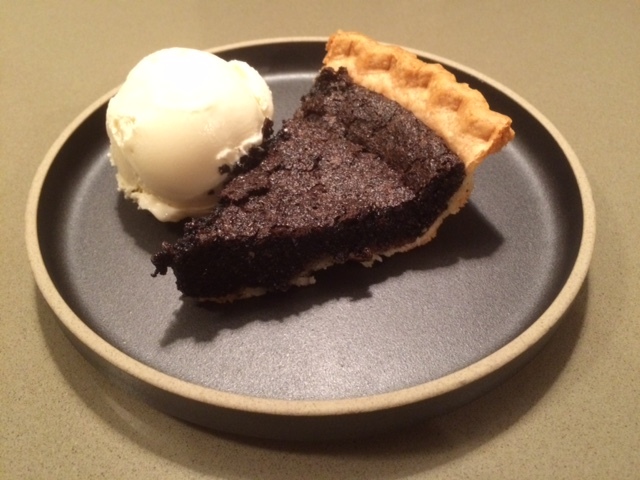 To me a good Chocolate Chess Pie should be served warm with cold ice cream to make the pie congeal. A bit like a warm brownie and ice cream. If you have your own version, let me know – I will try it! In a medium bowl, stir together both sugars, the cornmeal, nutmeg and cocoa powder, mixing until completely combined. Stir in the vanilla, butter, eggs and evaporated milk and mix until fully incorporated. When ready to bake, position a rack in the lower third of the oven and preheat the oven to 350 degrees. Pour the filling into the unbaked pie shell. Place on the prepared baking sheet and bake for 40 to 50 minutes. Remove the pie and cool for at least one hour. Serve with ice cream. I laughed out loud when I read it. Then I found Chris and read it to him. See, it is a perfect fit. How did I ever know three years earlier that I would find my single man who loves to cook, sleep, cuddle? Who not only knows how to cook, but loves to, and he listens, shares, and definitely cares more about my thoughts, and just laughs at my bra size. I have seen him change diapers, but know once that day comes he will sleep less, continue to cook, and we will listen and share with that little one together. Maybe now I should write an ad for what I want my next ten years to be like. If it comes anywhere close to what my senior year of college mindset gave me, life will be bliss. English Muffins. Who does not love them? My sister-in-law brought me her sourdough starter when she visited over Easter weekend. I shared my first week with a friend, was pooped the second weekend after my 1/2 marathon so threw some starter out, but this weekend, I baked! She left me with a recipe to make English Muffins. The photo to the left is what they looked like after done. Who knew that making English Muffins were so easy? Especially if you have a sourdough starter growing in your refrigerator. We do not eat a ton of bread. We would love to, but it is not what keeps our energy going. We stick more to fruit, vegetables, and proteins, but sometimes you just want fresh-baked goods. 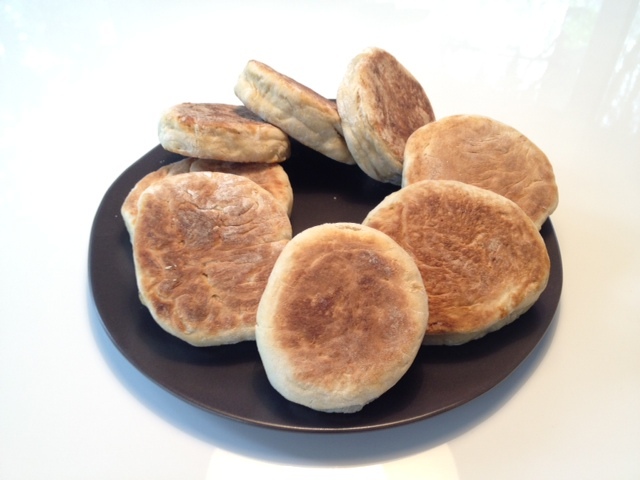 Over the weekend, I made these yummy English Muffins. Essentially you prep the starter to raise over night. It takes only a few minutes to prepare it. Let it rise. You can let it rise up to 24 hours. Many of the bread recipes that I follow you have to let it rise for a specific number of hours, so it is great that this recipe has flexibility. An opened ended recipe means you have more flexibility to live your life, and still have bread. Once you are ready to finish the English Muffins, it will only take a little less than 30 minutes to finish. Add a few ingredients, form into the muffins and cook on the stove. Finished. Use, or freeze for the future! I am also exploring using the starter for other bread recipes. Next week I might make pizza dough! *Note: The English muffins will turn out if you use water instead of full fat or fermented dairy and if you add more flour initially for easier kneading. However, the results will not be as soft on the outside or as tender on the inside once you’ve finished the cooking. Place 1/2 cup sourdough starter (thick or thin) into a medium size bowl. Pour onto that the 1 cup of liquid. This is the first place where the recipe is very flexible. Your liquid could be water, milk, any fermented dairy, coconut milk. Stir to combine starter and liquid. If your sourdough starter is very stiff, you might need an extra 1/4 cup of liquid. Once combined, add 2 cups of flour to the mixture. Use any combination of flours, white wheat, whole wheat, and rye. Stir well to combine. Cover and let your dough sit overnight, even up to 24 hours. In the morning, you will be able to tell that your sourdough has been at work. On top of your soaked dough, sprinkle 3/4 teaspoon salt (I use 1 teaspoon celtic sea salt), 1 teaspoon baking soda, and 1 tablespoon honey. Use a wooden spoon to push/cut/stir in your newly added ingredients. Don’t worry about incorporating it perfectly; you will be kneading it in just a moment. Pour about 1 tablespoon of olive oil onto your counter and spread it around with your hand and then rub your hands together. Dump out your dough onto the oiled spot and knead the dough for 2 to 3 minutes. The purpose of this kneading is to incorporate the honey, baking soda, and salt. After this, take a pizza cutter and separate dough into 8 equal portions. Dust your hands with flour before you shape each muffin. With dusted hands, pick up a portion and gently shape it into your muffin, usually about 1 finger thick and maybe 2-1/2 inches wide. Place your muffins on a lightly floured or cornmealed (greased might work if you want to stay away from newly added flour) sheet of wax paper or parchment paper. Cover with a dish towel and let rest while preheating griddle or skillet. About 5 minutes before you want to griddle/skillet your muffins, set the heat to mediumish. You do not want the muffins to brown too quickly because the insides need a chance to cook. Carefully transfer the muffins onto your heat source. Cook the muffins for about five minutes on each side. You can take a little peek every now and again to make sure the bottoms are not getting too brown. When it is time to flip, do this carefully. Your muffins will plump up beautifully, and you do not want to deflate them by being too rough. Cook for the second five minutes. Now, if you find that the outside edge of your muffin is not as done as you like, feel free to pop these into a 350 degree oven for 5-10 minutes.